Membership Application must be filled out correctly, with all 4 signatures required. Referred by: ???????? must be placed in the top, left hand corner of the application by the applicant. Referred by name should not be scratched out for any reason. New member’s first dues payment must be received before any incentive can be paid out to the referring member. Incentive payouts will be mailed the first week of every month from Local 2337. 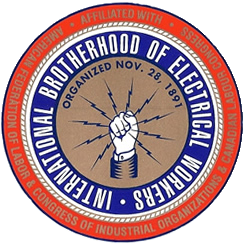 Membership Applications can be given to an Executive Board Member, Steward or mailed to Local 2337 to the attention of Cheryl Sneed. The cost to mail an application is one regular $.47 stamp. In an effort to ensure you have no taxes taken, the incentive award total, for 5 referrals, has been kept below $600. If the award amount exceeds $600, paperwork will be mailed and/or emailed to you. Paperwork will need to be completed and received by the Local before any additional incentive awards can be disbursed. Please email the office to make sure we have your current email address on file. If someone you know did not receive this letter, please have them call the office to make sure we have their correct mailing address. As always, if you have questions or concerns, please contact the Local office or a Local 2337 representative.